An abundance of warm spices with fresh lemongrass, and other classic Thai ingredients. 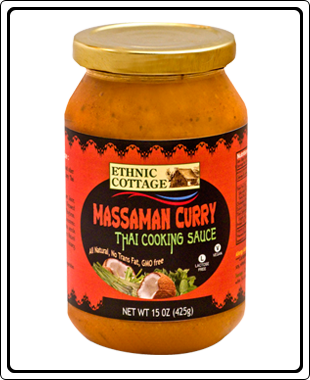 Ethnic Cottage’s Massaman Curry Thai Cooking Sauce contains No preservatives, No MSG. Ingredients : Water, Coconut Milk, Evaporated Cane Juice, *Coconut, Fresh Garlic, Fresh Ginger, Expeller Pressed Canola Oil, Naturally Brewed Soy Sauce (Water, **Soybean, ***Wheat, Salt), Lemon Grass Puree, Lemon Juice Concentrate, Sea Salt, Ground Coriander Seeds, Ground Cumin seeds, ****Cardamom, Annatto color, Ground Red Pepper, Natural Flavors and Extract, Ground Cinnamon, Ground Nutmeg, Dehydrated Spearmint Leaves and Xanthane Gum.